My Sony Clié NZ-90 is close to 4 years old, and getting rather flaky. The dock contacts have become unreliable, and the battery is getting tired. The battery was always the weak point of the Clié, I'm on my second one, but it is a constant hassle keeping it topped up. Frequently I've been forced to quit using it due to the battery running down. I was also unsatisfied with my LG 4400 Cel phone, mainly because the button that turns off the ringer was constantly getting bumped in my pocket, so I never knew if it was receiving calls or not. 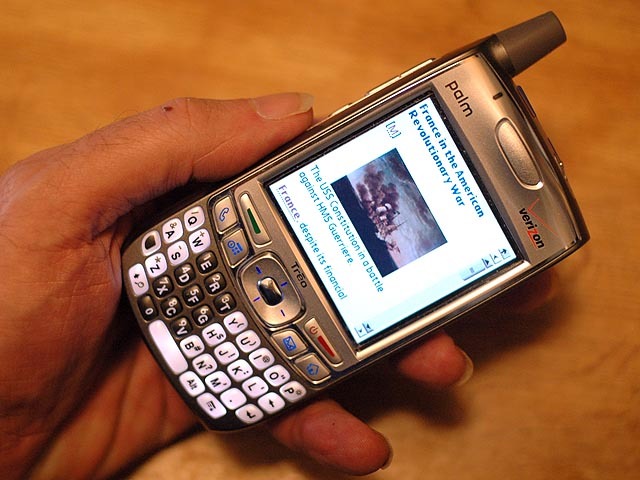 The opportunity to replace two units with one was irresistable, and Harriet bought me the Treo 700p for Christmas. I'm loving it! I do miss the larger screen of the Clié, and the nifty way it folds, but there's so much more to like about the Treo that I'm just delighted. It's really fast, and, after a bit of juggling around I've got it synching with both my iMac G5 at home and the MacBook Pro at the shop, using the Bluetooth connection. I bought a 4 GB SD card for it, of which 1.8 GB is occupied by Wikipedia. It is wonderful to have this at my fingertips. The Treo has a very fast Web connection, but my plan doesn't cover it, so I use the Web connection quite sparingly. AcidImage This is the software that lets me view my photographs, either individually or as slide shows. Very slick checkbook management program. Just amazing! A "killer app." This nifty shopping cart software is a big time saver, organizing my shopping list by the aisles of my favorite supermarket, so there's no backtracking. French/English dictionary. Not as useful as I had hoped, most words that I don't know arent listed. Good for a beginning French speaker though. The ultimate encyclopedia. 1.8 gigabytes, but I've got a 4 GB SD card, so I have room for it. Pretty good reader, works with iSiloX which allows conversion of Web pages and other documents into compatible files. Nice reader, lets me set preferred colors. This is the only reader that works with the SciFi books I download from Baen. Very nice reader, only option for Palm Press (formerly Peanut press) eBooks. I had to get this in order to read Wikipedia. I'm not crazy about it otherwise, like Mobipocket and eReader better. This was bundled with the Treo 700p, syncs various document types from my Macs. I haven't really used this much yet. Tile matching game, similar to Shanghai. Kinda hard to read the tiles, they're so small. Forum for Treo users, also vendor of Treo accessories.